Sticking to your New Year’s resolutions doesn’t mean you have to give up chocolate. (How depressing would that be?) Plenty of companies make healthy chocolatey snacks. As I’ve mentioned in previous posts, you can munch on chocolate-covered pepitas or a vitamin-packed chocolate muffin. And here’s a new idea: try an all-natural chocolate-nut energy bar. Three different brands now make chocolate-nut bars that are simple and contain six ingredients or fewer. (That’s a nice change from Atkins and Balance Bars that have tons of unpronounceable ingredients!) Here’s some quick info on each bar. Larabar’s Jocalat Chocolate: 6 ingredients: Organic dates, organic almonds, organic walnuts, organic cocoa powder, organic cocoa mass, organic cashews. 190 calories, 10 grams of fat. Clif’s Nectar’s Dark Chocolate Walnut: 5 ingredients: Organic dates, organic walnuts, organic unsweetened chocolate, organic cocoa, organic vanilla. 160 calories, 6 grams of fat. 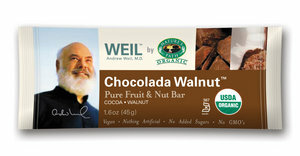 Dr. Weil/Nature’s Path’s Chocolada Walnut: 6 ingredients: Organic dates, organic almonds, organic dried unsweetened coconut, organic walnuts, organic natural cocoa, organic vanilla extract. 190 calories, 10 grams of fat. Did you notice that each bar includes dates? You can’t really taste them (at least I couldn’t); dates are just a good food substitute to use with chocolate (instead of butter, oil, or eggs) since they create a chewy texture and natural sweetness, and pick up the cocoa flavor nicely. Plus, dates provide fiber, potassium, magnesium, and calcium. I’ve tried all three brands and there’s practically no difference between them (coincidence, or are these companies copying each other?? ), except that the Clif and Dr. Weil bars contain only one kind of nut, walnuts, whereas the Larabar one has almonds, walnuts, and cashews. (And the Dr. Weil one has coconut, but you can’t really taste it.) Each bar will give you plenty of health benefits—the nutrients I mentioned from the dates and antioxidants from cocoa, as well as fiber, vitamins, and omega-3 fatty acids from nuts. By the way, don’t be alarmed that the fat content seems high–nuts have a lot of fat, but it’s the good kind, monounsaturated fat. Because these three bars taste so similar and have practically the same nutrients, calories, and fat, I can’t recommend one brand over another. Go with whichever is easiest to find in your supermarket or health food store!